Artist Rebecca Molloy, who recently graduated from Chelsea MA Fine Art in 2014, has had a busy year. Following her successful degree show in September 2014, Rebecca went off to Switzerland for just under a month to take part in the Trelex Residency. Through hard work and interesting collaborations, Rebecca’s practice continues to develop in leap and bounds. Residencies are a big part of life for students post-graduation, and Rebecca explained how her time in Switzerland taking part in the Trelex Residency has influenced her work, and how important residencies have been and continue to be for her practice. “In January and February 2015, I was artist in residence at The Trelex Residency, Switzerland. I was invited by artist Abigail Box way back in 2014 to take part, so when we finally arrived there was a great deal of anticipation and excitement about starting. The Trelex Residency is run by artist Nina Rodin and the three of us spent a great deal of time discussing our work and critiquing each others practices. Studio Shot, Trelex Residency, 2015. My work is largely made up of installations which combine painting, sculpture and video as a way to create an alternative understanding of the human form. My intrigue with the body is particularly fuelled by absurdity and strangeness and the source material ranges from images of skin pores, accumulations of animals, a female voice lowered by several octaves and oversize body parts. In previous works I’ve focused on using objects, films and painted surfaces to act as brush marks, textures, body parts and sensations, which was a way to explore painting within an expanded sense. During the residency I took this a step further by removing the act of painting all together and I tried to find ways in which I could still make paintings without using any paint. 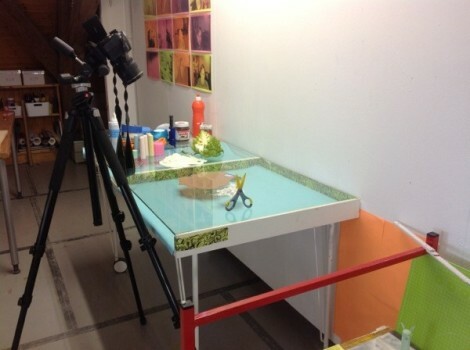 This included using food, items from the studio and film sequences that took on some of the components of painting. This process was exciting for me, as it opened up ideas around what painting can actually be. Just Sit Down and Let the Colours Go in Your Eyes, Still from 1 minute video clip, 2015. Video clip can be found on Vimeo. A large development on the residency involved me making a series of mini installations, these were combined from the use of videos on tablets, objects from the studios and actual body parts. I liked the idea of creating settings and scenes, and using elements within the work as props. The smaller scale allowed for a puppetry and interaction that I’d not previously encountered within my work. There was often a great deal of play involved when making and this included me and Abigail Box videoing ourselves stuffing our mouths with Nutella and marshmallows, squirting whipped cream in the forest and using our limbs as devices in videos. The interactions and collaborative process on the residency was incredibly important, and the element of chance and not knowing is a continual drive within my practice. Bad Limbs, Still from 1 minute video clip, 2015. 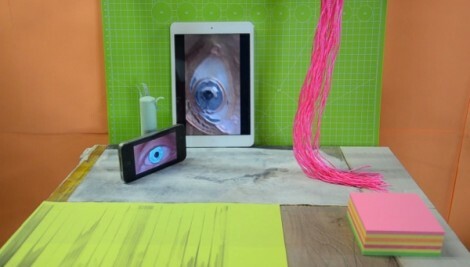 The isolating of body parts in a lot of the video work was of great interest to me. I found that using the tablets as a way to playback recordings of eyes, limbs and leaking cream and combining them with material components was an exciting way of exploring the idea of an image. For me this started to tap into my desire for constructing realities and I enjoyed getting lost in these worlds. There is some kind of feedback loop that is beginning to happen, as material gets reworked, reused and morphed into new scenarios it is beginning to take on its own language. Salmon Booby Snowman, Still from 12 second video clip, 2015. Whilst on the residency I tried to embrace making work outdoors, as this is something that I have never done before. 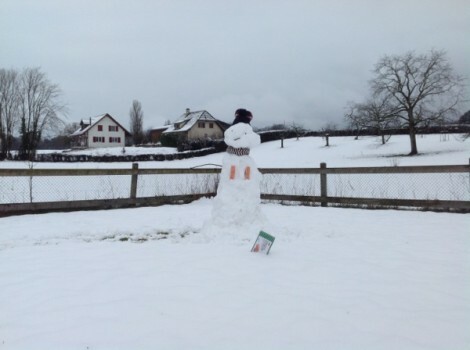 It was also a massive excuse to get out in the snow and make ‘The Salmon Booby Snowman’. I like that my work is developing into all kinds of scenarios and that it is able to adapt, I particularly like the clean knocked off head moment, which was thanks to the Boxster! As the residency was quite short, I collected a large amount of footage but didn’t get to finalise as much as I would have liked. However, whilst I was away I was excited to find out that I’d been accepted on the City and Guilds of London Art School Residency until September 2015 and I will use my time to develop and finish the ideas that I began on the Trelex Residency. ‘I’m also working towards a solo show in June, where the work will reach a final outcome. After such a fruitful time in Switzerland, we look forward to catching with Rebecca at the end of her next residency, and see all that she has achieved during that time.